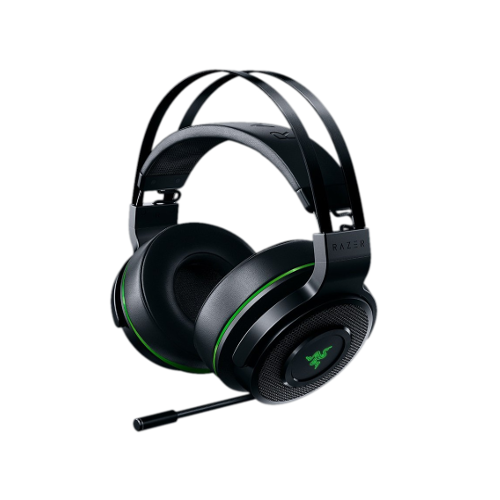 Can I charge my Razer Thresher Ultimate while playing games? Certainly! You can utilize the charging USB port at the back of the base station to charge your headset while you game. Are my headset and audio hub pre-paired? My Thresher Ultimate headset doesn't seem to connect with the audio hub even though the LED is blinking. Why? Once the two(2) devices are successfully connected, the LED lights of the headset and audio hub will become steady. Can I use my Razer Thresher Ultimate on PC? Yes. You can flip the switch at the back of the base station from Xbox One to PC and plug in the USB cable to your PC. No driver installation action required. My headset and transmitter are connected but I can't hear audio through the headset. What do I do? Razer products are designed to work well beyond when the warranty has expired. However, If you feel your headset is having issues we first suggest trying the headset on another computer/source to insure the issue is with the headset and not something within the computer system or source. If you have narrowed the issue to the headset itself there is not really a cost effective repair center that would be able to assist you. Razer does make available some basic external spare parts at http://www.razerzone.com/store/gaming-accessories, but we are unable to supply any internal parts or repair guides. I have a coupon/promotional/gift voucher code for the Razer Store. Where can I enter the code so I can use it to purchase products? I recently placed an order on the Razer Store and it still shows my order is "In Process." When will my order ship? Unfortunately, customer support has no information on future product or driver releases. For any information regarding future products, please visit our website or our social media outlets.